MONROE, La., Oct. 24, 2018 /PRNewswire/ -- CenturyLink, Inc. (NYSE: CTL) is expanding its portfolio of SD-WAN solutions, offering more technology choices for network transformation. CenturyLink will offer customers across the United States Managed Cisco SD-WAN powered by Viptela. This new offer provides the tools, technology and expertise needed to design, deploy, configure, migrate and manage SD-WAN services. CenturyLink will support the offer across Cisco’s Viptela vEdge series routers and enterprise network computer system (ENCS) 5000 series virtualized network platform, with multiple feature packages available. Customers will also have access to a dedicated CenturyLink SD-WAN portal. "This offer provides more choices for companies to achieve improved network optimization and deliver better performance for their customers," said Adam Saenger, vice president of networking solutions, CenturyLink. "We reduce the risk and complexity of WAN modernization with a complete range of global hybrid connectivity and SD-WAN solutions that offer better service quality, faster deployment and improved security, scale and cost efficiency." According to a recent Gartner report, Cisco owns approximately 60 percent of the traditional enterprise router market, worldwide, based on 2Q17 market share revenue.1 Managed Cisco SD-WAN is ideal for customers who are familiar with or prefer Cisco hardware because the offer makes it easier for them to integrate with their existing network infrastructure. "As more enterprise applications move to the cloud, it becomes harder for IT to optimize application performance while ensuring that the network stays secure. 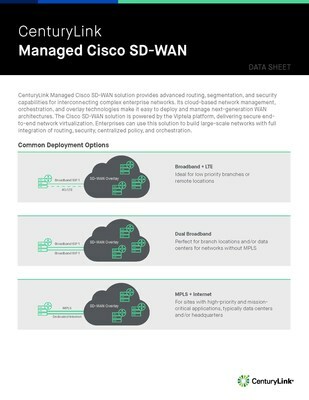 CenturyLink's new Managed Cisco SD-WAN offering removes that burden from IT, giving customers the confidence to tackle this new cloud-first world," said Ramesh Prabagaran, senior director of product management, Cisco. "We are excited to grow our relationship with CenturyLink, and are excited to offer their customers a simple, cost-effective SD-WAN solution." This offering highlights continued collaboration between the two companies. CenturyLink is a Cisco Gold Partner and a Cloud and Managed Services Master Partner. In 2017, CenturyLink introduced CenturyLink® Managed Enterprise with Cisco Meraki, a fully managed solution designed, configured, monitored and maintained by CenturyLink that allows single or multi-site customers to more efficiently and securely connect their workforce and locations, while also allowing them to monitor Wi-Fi networks, security, wireless, phone, and video surveillance, through a single administrative dashboard. CenturyLink Managed Cisco SD-WAN leverages the benefits of private networking such as MPLS as well as public networking to include dedicated internet access, broadband and wireless connectivity. CenturyLink launched its SD-WAN solution using the Versa Networks platform in 2016. Adding Managed Cisco SD-WAN powered by Viptela offers CenturyLink customers expanded choice and flexibility. CenturyLink's robust network allows customers to easily connect to more than 2,200 owned and third-party data centers as well as more than 100,000 on-net buildings. CenturyLink offers a broad range of connectivity options to meet customers' performance and efficiency needs, including MPLS, dedicated internet, broadband aggregation, 4G/LTE and/or Bring Your Own Network (BYON). CenturyLink is the recipient of MEF's 2017 Best Managed SD-WAN Service Worldwide. Discover more about CenturyLink's SD-WAN solutions.